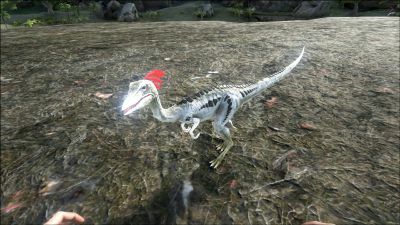 The Compsognathus (komp-sog-NAY-thus), or simply Compy, is one of the dinosaurs in ARK: Survival Evolved. One of the smallest predators on the Island, Compsognathus curiosicarius can be seen as a pet, a pest, or a threat. While alone, Compsognathus is not dangerous or aggressive. In larger packs, however, it remembers its underlying carnivorous nature. For some reason, Compsognathus is not naturally afraid of humans. Rather, it seems to be quite curious about humans and their instruments of survival. They tend to be drawn toward humans out of this curiosity, and then call their pack mates to help explore their discovery. This usually leads to the aforementioned pack aggression, with dangerous results. Compsognathus gain increasingly significant attack power and speed when in close proximity to other Compsognathus, as their pack aggression takes over their behavior. Additionally, their distress call carries quite far, rapidly alerting the tribe and its pets to danger more efficiently, and increasing the likelihood of forming a so-called "Compy Gang." Curious of humans, any Compy will be drawn to one simply by seeing it. Alone, a Compsognathus is not a threat and simply wishes to observe Humans, however, when mate boosted and in larger packs, these little terrors soon become aggressive and will attack anything, especially humans. If hungry enough, they are also prone to eat their fallen pack mates after a fight. The Compy, once tamed, is extremely loyal and loving to its new master, and can travel perched on their shoulder. However, the Compy is smarter than most of the other animals on the island, so to win one's affection during the taming process, Prime Meat is essential. Compsognathus is a diminutive theropod, and perhaps the smallest of the island's many dinosaur species. It has a slim and graceful build with a narrow head on top a snake-like neck and a few large osteoderms running down it's sides and back. A few feathers decorate its head, presumably to impress mates. Lean, quick-moving, and smart, they are common in wetter regions where their primary prey - small reptiles, mammals, and insects - are in abundance. Compsognathus are highly social and are often found in groups; they are known to extend their inquisitiveness to humans when they find them, but curiosity can quickly turn to hostility should the pack grow large enough to pose a threat. This section displays the Compy's natural colors and regions. For demonstration, the regions below are colored red over an albino Compy. The colored squares shown underneath each region's description are the colors that the Compy will randomly spawn with to provide an overall range of its natural color scheme. Hover your cursor over a color to display its name and ID. For example, "cheat SetTargetDinoColor 0 6" would color the Compy's "body" magenta. The Pack Boost is the number of the animals in the Pack. A "pack" of two Compys will receive a +1 Bonus, which will go up to +8 in a Group of 9 or more Compys. In order to attack the player, at least two Compys must be together. Further info on the effect needed. Wild compys will walk up to and follow players or tamed creatures and remain neutral. However, they attract more Compys, and if more than one are in the same area they will become aggressive and attack. Taming a Compy can be either the easiest, or the most dreadful tame a player can experience. A Compy takes very little to KO, however, they wake up extremely fast and will only eat prime meats during the taming process. Be careful if you have knocked multiple Compys unconscious, as they can quickly and suddenly wake up without warning, giving the others a chance to wake up while you are distracted. Finding a lone Compy or taking a smaller Carnivore to thin out larger packs is best when hunting Compys. If you are wearing Flak Armor, it is easiest to knock them out with 1-3 Tranquilizer Darts while they attack you, as they do little to no damage to Flak Armor. As with all creatures, it will eat the food left in its inventory if hungry, so don't put much more Prime Meat in them as they need, it might get eaten if they awake. 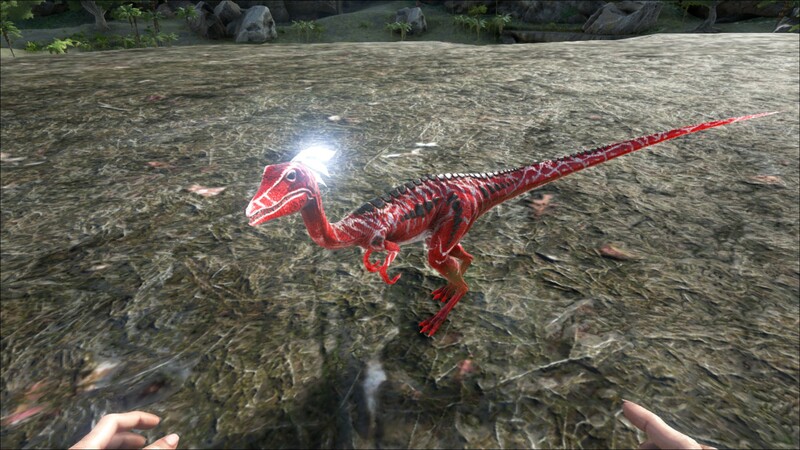 Using an Argentavis or a Pteranodon you can pickup the Compy and put in a taming bin, this is recommended as you need to get Raw Prime Meat to tame the compy. Their Torpor depletes fast and you will have little time to get Raw Prime Meat after you have shot it unconscious. When you've got both Narcotic and Raw Prime Meat, you can simply go into your taming bin and knock it unconscious. Put Raw Prime Meat and Narcotic on the compy and watch the Torpor closely. Compys only attack in groups, giving them a pack boost. It is recommended to back up while attacking to kill them one at a time and avoid being swarmed. If there is only one it will not attack, but you should be careful and prepared for others to show up. Compys are very weak, and even a primitive stone tool will deal with Compys. Group them up before you and use melee weapons with greater range like pikes or spears. As they chase you, they pile onto one another and get caught on each other, allowing you to deal with the one or two in the front. Just make sure you keep moving backwards, or they'll surround you! On a large mount like a Carno or Rex, it is often best to back up while biting or simply run away! Compies can easily swarm and swiftly kill a mount that does not have the HP to deal with the rapid attacks. Any melee weapon will do, but a longer ranged tool like a pike is recommended as it can keep the small Compys away from you with its knockback, as Compys are more easily affected by it than many other dinos. The Compy is really only truly dangerous against unprepared players or players caught unaware when the Compys are in large packs. Often a single Compy will lure other Compys into the area with a call. It is best to kill this single Compy or to knock it out and swiftly depart before they lure others in. Compys will quickly lose interest in a player that has retreated into the water, so its best to make a hasty retreat into the closest body of water if you find yourself surrounded by a pack. If you get attacked by a huge pack of Compys it's the best to run away for about 200 meters and then turn around. The Compys will arrive one at a time, allowing you to kill one, heal, and kill the next without danger. Compys are largely affected by knockback. First revealed by Jat on Day Five of the Jurassic ARK Event. In real life, Compsognathus was famous as the smallest Dinosaur for decades. However, later discoveries such as Microraptor were shown to be much smaller. The Compy can be carried on a player's shoulder. Compys gain a pack boost similar to the mate boost other creatures gain. The strength of the boost depends on the number of Compys around it. However, it maxes out at 8. In v224.1 when bred, the fertilized egg was located at the exact position where you tamed the female. This was reported fixed in v224.2. Many are still reporting this to be an issue on the ARK Steam forums, with the egg appearing in random places, likely where the Compy was during a server restart, or where tamed, if newly tamed. 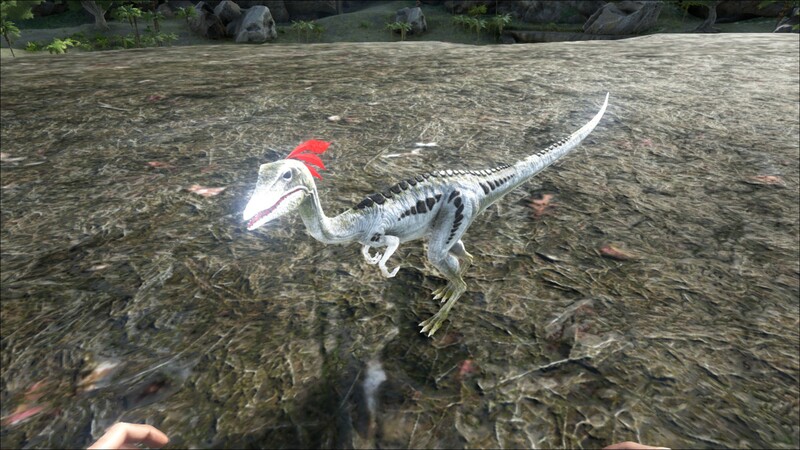 Compys currently do not poop (in v224.2) but lay eggs normally. The generic name means "elegant jaw". The specific epithet is a combination of curiosus ("curious"), referring to the Compy's curiosity towards humans, and either sicarius ("murderer"), referring to their high aggression when in packs, or carius (neuter of carior, ultimately from carus, meaning "dear, beloved"), referring to their loyalty and physical closeness when tamed. 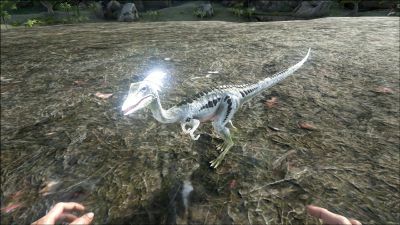 The Compy is one of the dinosaurs to have a death animation. The others being the Reaper, Dodorex, and Iceworm/Deathworm.